*Luka and Chip bred for April 2019 litter of F1b Pomsky puppies! *Luna and Obi... will be bred in Spring 2019 for F1 Pomsky puppies. 3. We live in Wisconsin, can you pick your puppy up in person? if not, see below. 4. We never Cargo Ship our puppies! We can meet you at (MKE) in Milwaukee, WI or (ATW) in Appleton, WI so you can fly in and take your puppy back home with you as a carry on. Travel expenses are at your cost. A small $50 fee for the appropriate under the seat carrier is also at your cost. If you don't fly, it's OK we do! *We only fly one puppy per week after they turn 10 weeks old. Book Early! *We only fly out on Tuesdays. *We fly to most Major airports. Please give us at least 2 closest airports to you. 5. We do not have an application process, we don't feel it's personal enough. We get to know all of our prospective families over emails, PMs, phone and text. Drop us a line and lets talk! 6. You must be willing to comply with both our purchase agreement and our spay/neuter policies. If you desire breeding rights for one of our puppies, please discuss this with us. There is an additional charge. We have put an enormous amount of time, work, research, money, love, sweat and tears into our dogs. We expect the same of someone asking for breeding rights. *Sample of puppy food that your puppy has been raised on. *Puppy Pack to help puppy settle into their new home! 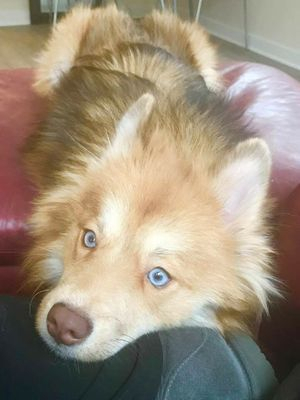 *Pomskies are very loving dogs, but they require a lot of attention. They love to be with their people and require daily exercise. *Early training and continued socialization is suggested. *Pomskies are a double coated dogs. This means they have a harsh outer coat and a dense fluffy undercoat. These dogs DO shed. *Pomskies howl, "woo" or bark like their parents do! *Pomskies love to dig and will dig holes, even in planters! *Pomskies should be on a leash, given the chance they will run! *Pomskies get the "Zoomies"! They will take off and run laps around your living room for a short period of time. *F1 Pomskies are 1/2 Husky and 1/2 Pomeranian, they tend to structurally look like their Husky moms, but smaller. *F1b Pomskies; are when you breed an F1 Pomsky back to one of the parent breeds, a purebred Pomeranian or a Siberian Husky. This makes them 25% Pomeranian and 75% Siberian Husky or vice versa. *F2 Pomskies both parents are F1 Pomskies. *Please do your research on both the Husky and Pomeranians before considering a Pomsky, ask us any kind of questions!